The more we’ve been keeping a tight focus on Mark’s blood sugar, the more I’ve found that bean recipes are both tasty and good sources of filling, slow-digesting carbs. We used to rarely eat them, but now I find myself cooking them once or twice a week and trying to come up with new and interesting recipes. One of the other things I’ve discovered is while I abhor canned chickpeas and actively avoid them in restaurants, ones that are cooked at home are an entirely different animal. Er, vegetable. Mellow and earthy, with none of that awful canned taste. I soak dry chickpeas for several hours, drain and cover them with fresh water, and cook on the stovetop for an hour and a half or so, until they’re nice and tender. Drain, cool, and use. Easy and good for you. The best bean cookbook I’ve found so far is one that dates back to the 80s. The Brilliant Bean covers an enormous range of recipes featuring both dry and fresh beans. I’ve only started scraping the surface of what it has to offer, but it looks very promising so far. This particular recipe began as one featuring Spanish chorizo, which I didn’t have on hand, but I had an open package of lap cheong. 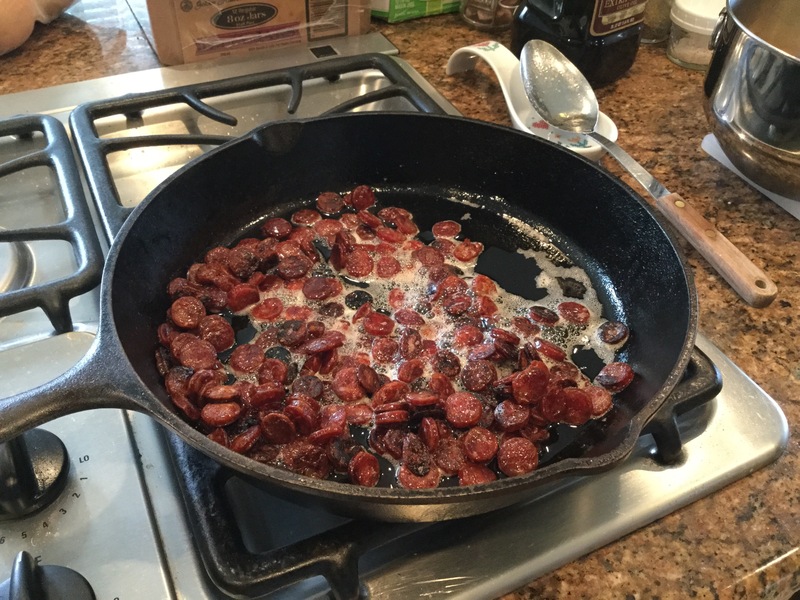 Lap cheong is a Chinese pork sausage, dried like salami and Spanish chorizo, with a mild sweet-savory taste. It’s also very fatty, making the rendering step the longest part of making this salad, if you’re not cooking your chickpeas from scratch. 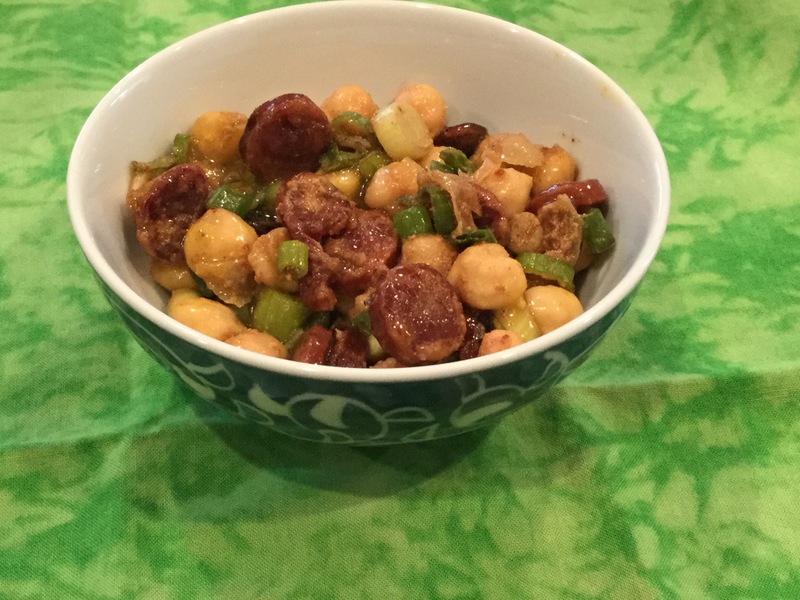 Don’t have Spanish chorizo or lap cheong? Pretty much any dry sausage, like salami, will work. Just cut it into pieces about the size of the chickpeas, and keep a close eye on it while it renders, since it may be less fatty and render more quickly. The flavor profile of the salad will be a little different, but it should still be delicious. Adapted from The Brilliant Bean, by Sally and Martin Stone. Makes approximately 7 cups, to serve 4 as a main dish. Render the fat out of the lap cheong in a dry pan over low heat, about 15-20 minutes, until the sausage pieces are crispy and browned. Remove them with a slotted spoon and place on paper towels to drain. There will be several tablespoons of fat remaining in the pan. If you’re feeling thrifty, save the rendered fat in a small container in your fridge and use it like bacon drippings for other recipes. You can fry eggs with it, turn it into warm salad dressing, saute onions with it, and so on. While the lap cheong is rendering, make the salad dressing. Combine the vinegar, olive oil, mustard, smoked paprika, ground cumin, soy sauce, and salt and pepper to taste in a lidded two-cup jar. Go light on the salt, since the lap cheong is salty. You can always add more after you taste the salad. Shake well to combine and set aside. Combine the chickpeas, onions, and cooled lap cheong. Pour the dressing over all, and mix well. Refrigerate for several hours for the flavors to meld and the dressing to be somewhat absorbed. Taste and adjust seasonings before serving. Serve at room temperature. This would make a pretty delicious lunch paired with another chunky salad (try cucumber, avocado, and tomato), along with some red grapes.